Display Your Wine In A Beautiful Way! Our VinoView shelving design displays your wine label forward to showcase your favorite bottles. Dramatic LED interior lighting perfectly illuminates your prized bottles. COMPRESSOR COOLING = LONGER LASTING State of the art compressor cooling technology lasts up to 2x longer than comparable Thermoelectric cellars. 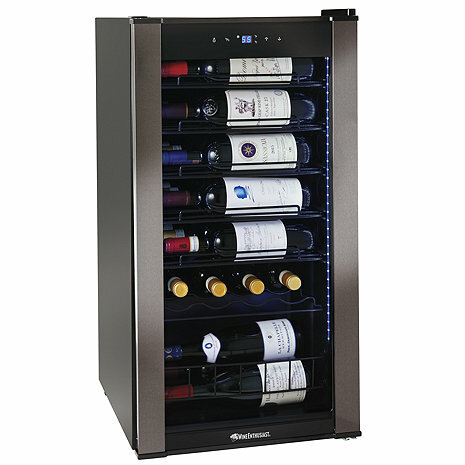 The Wine Enthusiast VinoView 28 bottle wine cellar is for small collections, by collectors with discerning tastes. Sleek in design and with state-of-the-art compressor cooling, our 28 bottle wine cellar showcases and protects your investments. Whether you need to lay down a few bottles or store wine at the proper service temperature, this model is an affordable form-and-function solution, offering the features of larger, more expensive refrigerators in convenient space-saving sizes. Black wire VinoView shelving design displays your wine label forward to showcase your favorite bottles. The shelves cradles your wine and slide out 50% to easily view your entire collection. This unit features an adjustable thermostat that can be set 39° F to 65° F; a temperature range of 46-65°F provides ideal storing conditions for reds and whites, and optimum serving conditions for most whites. Features double pane glass door with UV protection, black glass exterior door with black stainless steel trim, black cabinet, complete with cool LED display lighting. Place your wine cellar on a flat, solid floor that is strong enough to support it when it is fully loaded. Do not build-in or recess into closed cabinetry. Refrigerant R600a - 0.92 oz. Do the top five shelves hold four bottles each? If so, and the shelf pulls out only half way, how do you access the bottles behind the front two? Do you need to completely remove the first two bottles every time you want to grab the ones in the back? BEST ANSWER: Yes to both questions. Will standard Pinot Noir bottles fit without damaging the label or sacrifcing space? Can I remove racks and allow for bottles to stand up? BEST ANSWER: Yes, in order to do so you would have to remove the bottom two racks (ie. leaving only the top 4 racks in place). The bottles you see in the very bottom are an open tub area that can hold 4 bottles with 2 laying on top of the other two. Does it make noise at any time? BEST ANSWER: Yes. The compressor will power on (although the clicking on of the compressor is actually louder than the compressor itself, the noise certainly not being that obtrusive) when the unit rises 2 degrees F above the set temp, roughly about 5 times per hour for a few minutes each time. Robert, Yes this unit will make a little noise, but only when the compressor is cycling on and off. Is it safe to sit this unit on a wood floor? I am concerned about moisture or any water run off. BEST ANSWER: Yes, as long as there is sufficient clearance around the back and sides. Does this unit fit Champagne bottles? I have a new cooler. There is a nonmetallic piece that seems to be a back cover with no obvious place for it. Looking for a picture of the back showing compressor and tubing? BEST ANSWER: This is the condenser water catcher. It slides over the condenser and sits under the drain spout to catch the water that drips out. How to get extra shelf in? One just on top of bottom. Will magnums fit - 1.5 liter bottles? If so, how many? For current owners: how often does the unit cycle on and off? How consistent is the temperature? The older 28 bottle piezoelectric model fans run 30+ seconds out of every 120 seconds, and the temperature constantly fluctuates between 54 and 55. Is this better? BEST ANSWER: It cycles on about every 10 minutes or so, roughly when the temp rises 2 degrees above the current setting. I find the actual temp to be about 4-5 degrees warmer than what the LED readout shows so I set it for 55 for a desired 60 for my reds. Upon further inspection, I learned that if the LED temp reads 55, the bottle temp at the bottom is 57 and the bottle temp at the top row is 62. Can you locate this cellar in a closet? BEST ANSWER: Kate, It really depends on the size of the closet. As long as there is ventilation in the closet and it is not stored directly against a wall you shouldn't have a problem. Keep in mind this is a free standing unit so it is not intended to be placed in super tight spaces. Our house is pretty open with lots of windows. Will the wine be adequately protected from all the sun? BEST ANSWER: As long as the door is faced into the room and lights are not on around the clock. If not, create a wine room environment. If you are storing investment grade wines consult someone. The glass from is dark. You are save. I would not place the unit facing the window in direct sunlight. Can't help you. Our cooler arrived damaged and we opted for a different brand. Will this unit be ok in a garage that goes from 40 degrees in the winter to about 90 degrees in the summer? BEST ANSWER: While our unit is inside the house, I believe most compressors for refrigeration are built to withstand the temperature swings you describe. We have a large refrigerator and freezer in our garage that have to withstand greater temperature swings than yours, and as long as there's adequate room around the unit for air circulation, you should be fine. how do you install the drip tray ? BEST ANSWER: I am not aware that the drip pan requires installation. Mine arrived installed above the compressor which would act to evaporate any condensation generated by the cooling. There has been no fluid below the unit. Operational about two months. Does this unit have a locking door? Is this CEC compliant? Can it ship to Ca? BEST ANSWER: Yes this item can be shipped to California. Thank you! Is this CEC compliant? Does it ship to Ca? Fridge is beeping and is reading eh? Does the unit require more than the indicated width to open the door and access the bottles? BEST ANSWER: does the glass door protect against UV light? I found a sitting wine bottle with clips on the back. What are the clips for? BEST ANSWER: Depends. Where did you find the bottle? Can this wine cellar be placed under a counter if it has ample ventilation space in the back and on the side? BEST ANSWER: McKenna, This unit is really designed to be free standing, we don't recommend instillation under counter or any enclosed spaces. BEST ANSWER: Jeff, The control panel is on the outside of the door, for this reason the door cannot be reversed. Thanks! ware does the drip tray go ? Is this unit 17 inches wide as noted here online or 20 wide as jndicated in the wine enthusiast February 2019 print catalog? Just received mine. Is the lower back, where the power cord and cooling mechanism is, supposed to be open. Should there be a plate or something that goes there? It works well. I like how the interior light makes it easy to read the labels. Bought two of these on sale. Delivery was prompt with good packaging. Units got to temperature and can fit small diameter Pinot/Chardonnay bottles in addition to Cabernet bottles. You have to be creative and stagger bottles to fit bigger Pinot/Champagne bottles but we were successful. Beautiful to look at. Nice and compact. Accurate. One of the shelves’ wires broke at first use so it’s a little fragile. Nice for the person new to the challenge of wine storage. Recommend this product. Very nice for the price. Bottles are hard to get in the back of the shelves. Keeps temperatures well within range. This unit fulfills all that is promised. It also seems troublefree. We really like this wine cooler. It's compact yet holds a nice amount of bottles and very attractive. The light is especially nice! I would recommend this wine cooler to anyone who has limited space but wants to display their wine in a beautiful way. just received my unit. let it set, plugged it in and it is AWSOME!! love it!! holds temps as stated. looks incredible with the lights on!! would highly recommend it!! This wine cellar is supposed to hold 28 bottles, but not if they have an 11-inch circumference or larger (e.g., champagne). To hold these wider bottles, a couple of shelves have to be removed. Otherwise, it's a bargain at $299.00. Love it, fits great in my "bar@ area! Hubby was a nay sayer at first, but even he had to agree that this was a nice addition ?? Much quieter than our last 18 bottle wine enthusiast cooler. Makes a funny gurgling sound when I open the door but so far so good! We bought this wine cellar and it's been great. Wish we had another one too! Maybe we'll buy a second one. Bought it after receiving the notice of price increase at year's end. Saved $50 so thanks to Wine Enthusiast for the heads up. This was a purchase for basically the better bottles in the collection and longer consistent temp storage. As to the Cellar, it has functioned perfectly so far. After resting 24 hours, plugged in, set it to 39* to test range and reached it fairly quickly. I then loaded it and set to 55* which the unit has no issues maintaining. Seems silly to rate anything so soon but the design and build quality are excellent. I get every kind of bottle shape into it using the lower basket and have 28 bottles fitting, even with Pinot and Aussie Shiraz in the mix. I alternate the direction of the bottles on the shelves for slightly easier identification. This is sited in our upstairs Pantry, which is why I wanted a compressor model. We use pocket doors to enclose the Pantry so I was concerned about the Thermo-electric designs in that space.The larger portion of the wine collection stays in the basement in a natural cellar room with shelving, which in Winter can reach the mid 40's. Unfortunately in Summer, although the coolest place in the house, temps can still approach 68* on occasion. I now have the best of both worlds in terms of storage and upstairs convenience as well. Both my wife and I are very pleased. I love everything about it — size, no sound, it’s perfect — and the price was doable for a modest income. I love my 28 bottle wine cellar and it does just exactly what it's supposed to do. The wine is beautifully displayed, easy to load and unload. If you're looking for a small but efficient wine cellar then I would recommend this product. Bought this for my son for Christmas. (Should have kept it for myself!) He said it is wonderful. Just the right size. No to big, but large enough to handle a case of wine plus. Always happy with my purchases from wine enthusiast. Fast delivery too! Highly recommend. Keeps our wine at perfect temperature and stores a lot; We could have used a larger unit and might buy another. It by far outperforms the unit it replaced. Nice little cabinet that I typically stock with wines of the month and have removed the lowest tray to make room for standing up bottles. This allows me to store the open bottle at the right temperature while we enjoying it?? The wine cooler is well made and professional looking. On of the light bars stays lit although it is supposed to turn off. We made wine enthusiast aware of the situation and they kindly gave us a discount for the issue. So far, I really love it! I've noticed it's very sensitive to power flickers from storms though, but throwing the breaker gets it going again. The wine cooler purchased a month ago is working fine so far. It delivers all the features advertised with minimum noise. Wine cooler is a nice size and the lights make a great impression. Instructions could be better especially with regard to loading bottles and moving shelves. This cooler is perfect for my wine needs. I keep several (up to 28) bottles chilled with others in my wine rack. It is well lighted and good for both red and white. It’s nosier that I expected. The bottom shelf guides are placed in such away that the shelf itself is below the guides making the shelf unstable. Will replace my other wine coolers with this one when they die. Nice comressor style wine cooler. So far it is maintaining a consistant temperature. For viewing wines I would rather the bottles be stacked front to back rather than side by side. Quiet but not easy to load. Quiet. Love bottom opening for storage of dessert wine. Shelves do not move smoothly, almost too tight. The performance of the cooler is very good however, I find the lateral bottle storage to be less convenient than the front to back storage that I have in my two older units. It is pretty quiet and I like the way the bottles stack. It gives me a lot of storage in a small space. The temp fluctuates about three degrees but that, in the long run, should not harm the wine. If I was a real wine collector I would be concerned about this. I think this fridge is loud. You can buy the silent version for $100 less at Costco. It seems to be louder than our previous wine cooler. But overall it’s a nice unit. 1. I regulates the temperature quite well. 1.The bottom most shelf was practically impossible to operate at first. The plastic coating on the rack was not uniformly applied so it wouldn't slide across the shelf support. First thing I had to do was cut off the excess with a razor-blade knife.Then to even it out again I had to sand it with fairly coarse sand paper. 2. The interior light is a LED string attached to the frame of the door. When the door is opened, the light no longer shines inside the cooler but instead shines up in my eyes making it difficult to see the contents. Not sure how well it will last and how well it with chill. Fits my space and price was competitive.